This “chirped-pulse amplification” has become a staple of high-power lasers. 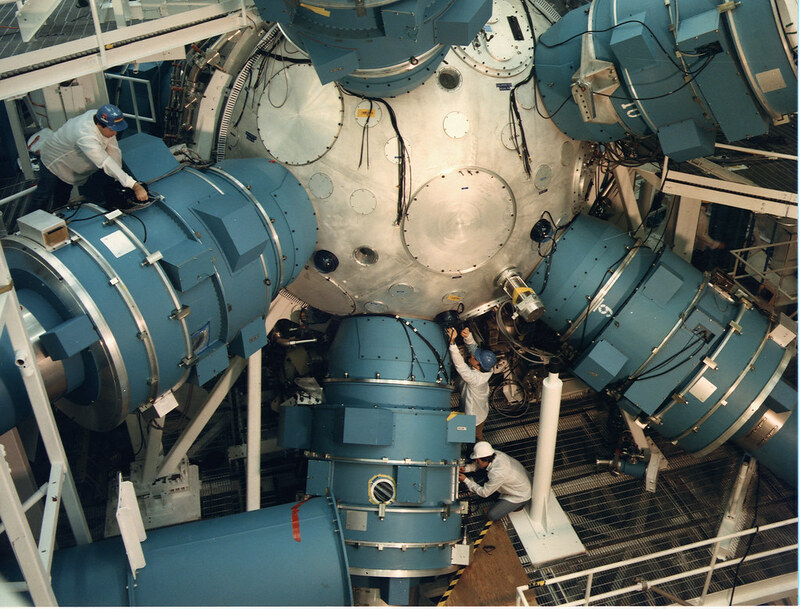 In 1996, it enabled LLNL researchers to generate the world’s first petawatt pulse with the Nova laser. Since then, LLNL has pushed to higher energies in pursuit of laser-driven fusion. The lab’s National Ignition Facility (NIF) creates pulses with a mammoth 1.8 megajoules of energy in an effort to heat tiny capsules of hydrogen to fusion temperatures. However, those pulses are comparatively long and they still generate only about 1 PW of power. To get to higher powers, scientists have turned to the time domain: packing the energy of a pulse into ever-shorter durations. One approach is to amplify the light in titanium-doped sapphire crystals, which produce light with a large spread of frequencies. In a mirrored laser chamber, those pulses bounce back and forth, and the individual frequency components can be made to cancel each other out over most of their pulse length, while reinforcing each other in a fleeting pulse just a few tens of femtoseconds long. Pump those pulses with a few hundred joules of energy and you get 10 PW of peak power. That’s how the SULF and other sapphire-based lasers can break power records with equipment that fits in a large room and costs just tens of millions of dollars, whereas NIF costs $3.5 billion and needs a building 10 stories high that covers the area of three U.S. football fields. Raising pulse power by another order of magnitude, from 10 PW to 100 PW, will require more wizardry. One approach is to boost the energy of the pulse from hundreds to thousands of joules. But titanium-sapphire lasers struggle to achieve those energies because the big crystals needed for damage-free amplification tend to lase at right angles to the beam—thereby sapping energy from the pulses. So scientists at the SEL, XCELS, and OPAL are pinning their hopes on what are known as optical parametric amplifiers. These take a pulse stretched out by an optical grating and send it into an artificial “nonlinear” crystal, in which the energy of a second, “pump” beam can be channeled into the pulse. Recompressing the resulting high-energy pulse raises its power. To approach 100 PW, one option is to combine several such pulses—four 30-PW pulses in the case of the SEL and a dozen 15-PW pulses at the XCELS. But precisely overlapping pulses just tens of femtoseconds long will be “very, very difficult,” says LLNL laser physicist Constantin Haefner. They could be thrown off course by even the smallest vibration or change in temperature, he argues. The OPAL, in contrast, will attempt to generate 75 PW using a single beam. But a very intense laser could, in principle, separate the particles before they collide. Like any electromagnetic wave, a laser beam contains an electric field that whips back and forth. As the beam’s intensity rises, so, too, does the strength of its electric field. At intensities around 1024 W/cm2, the field would be strong enough to start to break the mutual attraction between some of the electron-positron pairs, says Alexander Sergeev, former director of the Russian Academy of Sciences’s (RAS’s) Institute of Applied Physics (IAP) in Nizhny Novgorod and now president of RAS. The laser field would then shake the particles, causing them to emit electromagnetic waves—in this case, gamma rays. The gamma rays would, in turn, generate new electron-positron pairs, and so on, resulting in an avalanche of particles and radiation that could be detected. “This will be completely new physics,” Sergeev says. He adds that the gamma ray photons would be energetic enough to push atomic nuclei into excited states, ushering in a new branch of physics known as “nuclear photonics”—the use of intense light to control nuclear processes. Besides making lasers more powerful, researchers also want to make them shoot faster. The flash lamps that pump the initial energy into many lasers must be cooled for minutes or hours between shots, making it hard to carry out research that relies on plenty of data, such as investigating whether, very occasionally, photons transform into particles of the mysterious dark matter thought to make up much of the universe’s mass. “Chances are you would need a lot of shots to see that,” says Manuel Hegelich, a physicist at the University of Texas in Austin. A higher repetition rate is also key to using a high-power laser to drive beams of particles. In one scheme, an intense beam would transform a metal target into a plasma, liberating electrons that, in turn, would eject protons from nuclei on the metal’s surface. Doctors could use those proton pulses to destroy cancers—and a higher firing rate would make it easier to administer the treatment in small, individual doses. Physicists, for their part, dream of particle accelerators powered by rapid-fire laser pulses. When an intense laser pulse strikes a plasma of electrons and positive ions, it shoves the lighter electrons forward, separating the charges and creating a secondary electric field that pulls the ions along behind the light like water in the wake of a speedboat. This “laser wakefield acceleration” can accelerate charged particles to high energies in the space of a millimeter or two, compared with many meters for conventional accelerators. Electrons thus accelerated could be wiggled by magnets to create a so-called free-electron laser (FEL), which generates exceptionally bright and brief flashes of x-rays that can illuminate short-lived chemical and biological phenomena. A laser-powered FEL could be far more compact and cheaper than those powered by conventional accelerators. Both the linear collider and rapid-fire FELs would need thousands, if not millions, of shots per second, well beyond current technology. One possibility, being investigated by Mourou and colleagues, is to try to combine the output of thousands of quick-firing fiber amplifiers, which don’t need to be pumped with flash tubes. Another option is to replace the flash tubes with diode lasers, which are expensive, but could get cheaper with mass production. For the moment, however, Li’s group in China and its U.S. and Russian counterparts are concentrating on power. Efim Khazanov, a laser physicist at IAP, says the XCELS could be up and running by about 2026—assuming the government agrees to the cost: roughly 12 billion rubles (about $200 million). The OPAL, meanwhile, would be a relative bargain at between $50 million and $100 million, Zuegel says.